Join us for a night of LIVE Latin music at its best, with the fantastic Latin Rhythm Boys! Live salsa music is once again taking the San Francisco Bay Area by storm. Every week more and more nightclubs and venues are adding live salsa nights to their calendars. And given the origins and influences of this musical genre, enjoyed all over the world, it is no wonder that as the live music scene in the San Francisco Bay Area (and beyond) rebounds, dancing to live Salsa takes center stage (once again). After all, some historians have described "salsa" as a word with "vivid associations," fusing swing, soul music, jazz, (Puerto Rican) bomba y plena, and the Cuban "son." It is this fusion of international musical (and cultural) influences which makes salsa so appealing to so many people. 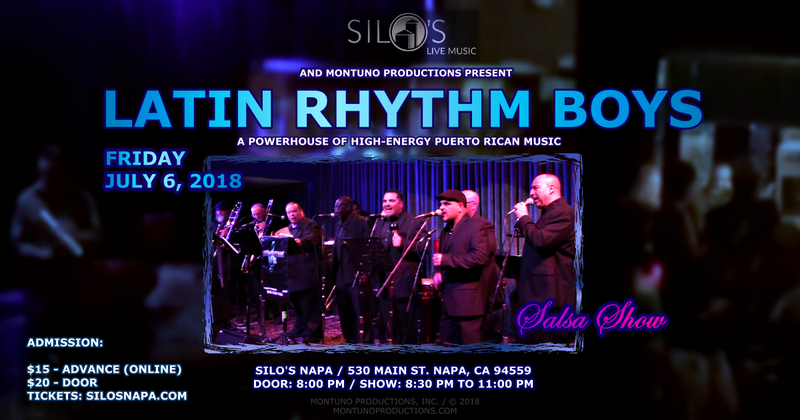 And speaking of cultural influences, there is one orchestra charting a new course in the San Francisco Bay Area Salsa scene: Latin Rhythm Boys! In 1963 Jr. Henry Miranda’s plan came to fruition. A lifelong Cuatrista, he brought his amazing music from Hawaii to California where he formed the group “Jr. Miranda and His Latin Rhythm Boys”. He inspired and mentored many, leaving behind a musical legacy for his sons Earl R. Miranda and Henry Miranda Jr.
Latin Rhythm Boys–The modern-day brainchild of brothers, Earl and Henry Miranda Jr.–has evolved into a powerhouse of high energy Puerto Rican Music that includes Salsa as well as their specialty Jibaro sound. Reminiscent of the FANIA All Stars, these bad boys of Latin Music are hitting the world by storm. To date this phenomenal specialty band combines expertise sounds acquired throughout the Bay Area, Puerto Rico and New York City. Latin Rhythm Boys continue to captivate their fans and audiences with their unique musical style and stage presence. With two successful CD launches under their belt, "Musica De Mis Padres" in 2005, and "Year of The Cuatro" in 2013, they're about to release their third CD project, featuring multiple award-winning invited guest artists such as Grammy Award winner (the late) Johnny Polanco on Trombone and Tres Guitar, Artie Webb on flute, vocals by 8-time Grammy nominee & 3-times Grammy winner Willy Torres, as well as other Latin music luminaries like Chino Nuñez, and Jimmy Bosch, among others.